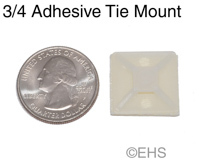 These are .75" square tie mounts with a double-sided tape backing. Just peel the backing and stick. Also has 2 screw holes if you need a stronger mounting. Great for locations you don't want to put screws into. These are for lighter-weight applications, 1-2 cables in most cases.